On March 27, 2019, surrounded by her family, Martha Lee Clements gracefully crossed over to her new home. Martha was born September 26, 1933 in Powhatan, VA to the late Freeman and Ida Redd Scruggs. She was one of ten siblings. Martha accepted the Lord at an early age and was baptized into the family at Hollywood Baptist Church, Powhatan, VA. She later joined Greater Harvest Baptist Church in Newark, NJ. 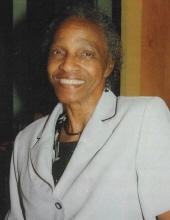 Martha attended public schools in Powhatan, VA and retired from the Newark Public School system as a custodian. Early in life, she married Kermit Clements, Sr., her dedicated husband of sixty-eight years. The two relocated from Virginia to Long Island, NY, then settling in Newark, NJ for forty-five years before returning to Richmond, VA.
Martha was preceded in death by two sons, Gilbert and Gary Clements; her siblings, Lillian (William) Tucker, Willie “Buck” (Mary) Scruggs, Freeman “Bubba” (Irene) Scruggs, Allen (Emily) Scruggs, William “Henry” (Chaney) Scrugs, Franklin (Elizabeth) Scruggs and Kelson Scruggs. Memories will be cherished by her husband, Kermit Sr. and her children: Kermit Jr. (Kathleen) Clements, Dolores Clements-Bedasee and Demetria Garden; her four grandchildren along with five great grandchildren; sisters, Annie Mae (John) Mayo and Lillie (Waverly) “Mike” Epps; two sisters-in-law, Jacqueline (Garfield) Brown and Caroline (John) Clements; one brother-in-law Alburn (Addie) Clements; nephews, nieces and other relatives. With her loving spirit, others were drawn to her outgoing nature and infectious smile. From children to animals, her personality was like a magnet. Music always filled the home as she loved to sing and dance. She was best known for her delicious potato salad recipe that kept folks coming back for seconds. Martha often encouraged others by saying “Keep your hands in God’s hands”. What privilege Martha had to walk in this life with three best friends. Martha and sister Lillie were fondly called Pop & Doll while growing up. Josephine Phillips was always a loyal friend. And, sometimes you have a friend who is morelike a sister. Addie Clements was that to her. The eternal cord between the two could never be broken. With strength and grace, she dealt with her physical condition, never a complaint. Days before her passing, she said, “I will beat this”. Funeral Services Saturday, March 30, 2019 at 2:30 p.m. at Hollywood Baptist Church, Powhatan. Interment church cemetery. To plant a tree in memory of Martha Lee Clements, please visit our Tribute Store. "Email Address" would like to share the life celebration of Martha Lee Clements. Click on the "link" to go to share a favorite memory or leave a condolence message for the family.